Sadly neglected on release, Stephen Hopkins' The Ghost and the Darkness is a rip-roaring (literally!) 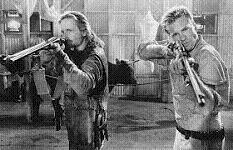 old-fashioned actioner. 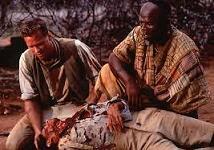 Set in 1898, the film is based on the horrific true story of Irish Colonel John Patterson (played in the film by Val Kilmer) who is tasked with building a railway across Kenya. It's a job suddenly thwarted by the presence of two monstrous lions who proceed to stalk and eat the workers over an extended period (Patterson claimed in his book Man Eaters of Tsavo that the figure reached 135). Dubbed "the ghost and the darkness" by the locals, who attribute the lions' dogged persistence to evil spirits, Patterson faces not only challenges to his authority but a much more immediate sense of danger. It's an incredible story and the film, in all fairness, doesn't do it justice, adding in Michael Douglas' fictional hunter character presumably to sell the film to American audiences. Where it does succeed, however, is in the realm of atmosphere, rendering the Kenyan landscape a mystical and engrossing place of conflicting cultures and unseen dangers lurking in the undergrowth. Adding immeasurably to the drama is the magnificent score from Jerry Goldsmith, one of his finest efforts in the genre and one that confirmed his mastery at fusing authentic ethnic sounds into a sizeable orchestra. 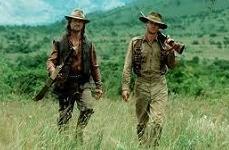 Goldsmith for his part paints on a broad canvas, rendering the film musically as a grand colonial adventure. It's the best possible approach: bold in the sense of wonderment at the African landscape, fused with a sense of mystery and also sheer terror as the fearsome lions go on the rampage. His Main Theme is a terrific blend of three disparate cultures, Irish, English and African, with a lively flute melody leading into a powerful horn/Swahili choir combination, saying all that needs to be said about the film in the space of two minutes. No other composer would likely have attempted such an ambitious thematic blend. It so perfectly mirrors Patterson's initial reaction to the lush landscape that you wonder if the film would work at all without it. But of course Goldsmith, being the brilliant composer he is, doesn't rest on his laurels. The early parts of the album put the theme through a number of variations, from the celebratory The Bridge to the tender, gorgeous romance of Catch a Train, prior to the later, unfortunate turn of events. The malleability of the theme, combined with its complex construction, marks the composer at his absolute best. 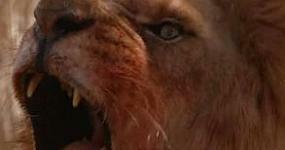 Lions Attack marks a complete turnaround and explodes in frenzied terror as the creatures cause havoc in the Tsavo camp, piercing ethnic vocals cutting through the orchestral carnage. This is then undershot by a moment of heart-breaking sadness as the aftermath of the massacre is unveiled, before leading into the lion theme proper, an imposing brass led melody with commanding vocals and the tribal percussion sounding an ironic triumph for the animals. First Time indicates that things may be on the up again with a glorious rendition of the main theme but it doesn't last. Starling's Death is pure bone-chilling horror, the choir used in a whispering counterpoint to Goldsmith's brassy outbursts, percussion and disturbing screeching effects. In combination with the shots of mysterious, swirling grassland as seen in the film, it works absolute wonders. As the score continues, the lions' theme is taken to even greater heights, even, in Lions Reign, taking on a definite supernatural sheen through the eerie vocal and wind effects. Preparations leads the charge back, the orchestra and choir used in a more defiant, heroic fashion before Remington's Death reintroduces a note of genuine heartbreak in the face of adversity courtesy of some powerful orchestral work. Prepare for Battle builds the heroic material again through the bolstered brass section and choir. Final Attack is the most abrasive and terrifying of the action pieces as Patterson reaches the showdown with the monsters, the snarling orchestra and undulating choir/screeching percussion reaching dissonant proportions. The subsequent noble rendition of the main theme at the track's close is like a sunrise on a summer's day, ushering in the magnificent finale Welcome to Tsavo that reinstates the theme in both its romantic colonial variation and celebratory African one. Truly, it's one of the composer's finest cues. 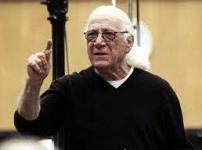 Jerry Goldsmith was truly one of a kind, able to transport the listener to whatever milieu or situation he was musically representing. With The Ghost and the Darkness, he takes us across the plains of Africa, stares terror in the face and celebrates the beauty of a magical country. It's a brilliant, brilliant score, and deserves to rank among his more famous masterpieces. And remember: "If you dare lock eyes with them... you will be afraid...". The soundtrack album can be found at Amazon.co.uk and Amazon.com. 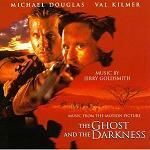 Theme from "The Ghost and the Darkness"
Dueling Chants, Part I: "Jungal Bahar"